With foam filled, no-flat, 10” rear wheels and 8” front casters they are designed to navigate just about any terrain. Extending platform from 34” to 52” in length and a carrying capacity of 227kg. 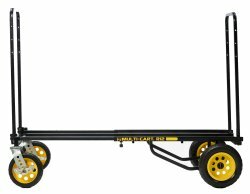 This cart folds flat for storage and transport, ideal for moving boxes and large, awkward to move items of furniture.